A native perennial species between 1-3 feet in height, with the flowers in a tight brown bunch apparently produced from the side of the stem about a fifth of the way down from the top. The stem is circular in cross-section and obviously ridged just below the flowers. There are no leaves. 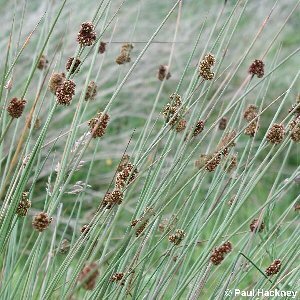 Very common, locally abundant or dominant in wet acid pastures and bogs. 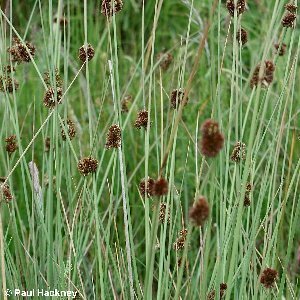 This species can be confused with Juncus effusus var. compactus.